Coordinators from the city of Mission organize at the Mission Fire Station on Thursday before the start of the weekend, planning for a weather disturbance that is predicted to bring heavy rainfall. Hidalgo County Emergency Management officials received a report from the National Weather Service this morning indicating the Rio Grande Valley will start seeing bands come in clusters of heavy rains after lunchtime Friday. County officials said during a press conference Friday morning that they are anticipating 4 to 8 inches of rain on already-saturated grounds. 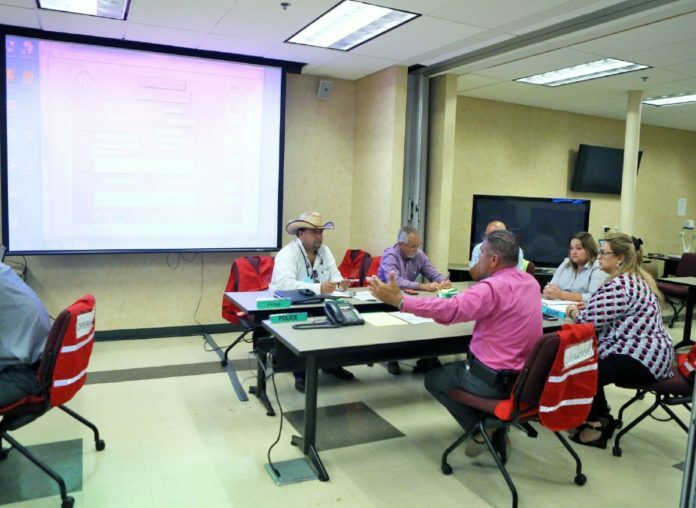 The state is 72 percent saturated, Hidalgo County Emergency Management Coordinator Ricardo Saldaña said. “Here we’re totally saturated,” Saldaña said of the region. The county is currently under a flash flood warning, as the area is expected to see more rain on Saturday before slowing down Sunday, unless the system stalls, according to Saldaña. Emergency management officials are also looking into opening shelters at the Donna Rec Center located at 307 Miller Ave. in Donna, First Baptist Church located at 600 S. Kansas Ave. in Weslaco, and La Joya ISD’s Memorial Middle School located at 2610 N. Moorefield Road in Mission. The county’s emergency operations center went from running at a partial to a full-time level and residents with any questions or concerns can call (956) 292-7050.